Just take another lap. That is what my wife Jenny told me. I quickly responded, “Why? I can’t get to the finish line in time and I am running SO slow. I am losing time.” She repeated, “Just take another lap.” And finally, after she repeated it about five times, I said fine, and I took another lap. On that lap, everything changed. It was October 11th, 2014 and I was in Spotsylvania, Virginia. 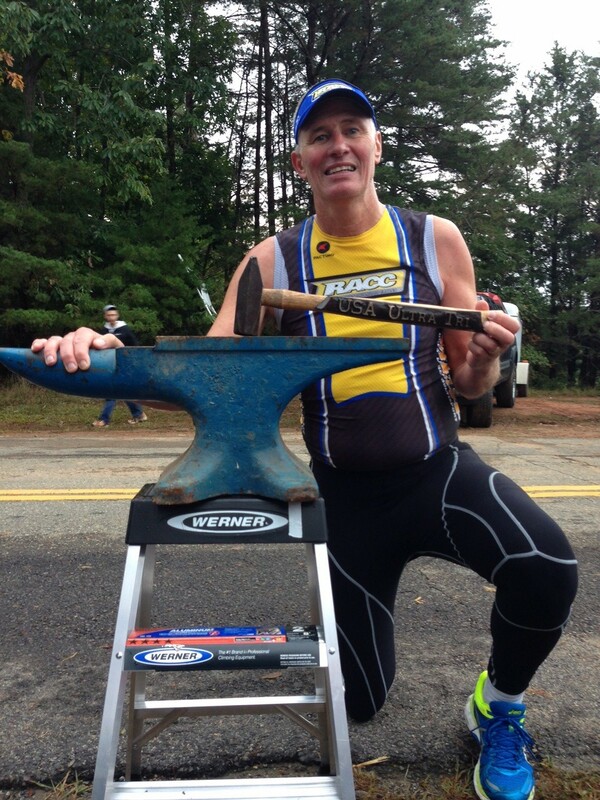 I was competing in the Double Ironman Competition (called a Double Anvil) along with eleven other competitors. It was 5:00am on a Saturday, and I had already completed a 4.8-mile swim and a 224-mile bike in approximately 22 hours. I had 52.4 miles left to run in the next 14 hours to finish before the cutoff. If you don’t finish before the cutoff, it’s like you never raced the race at all. No results, no finisher’s medal, and literally thousands of training miles for nothing. It’s just a DNF (Did Not Finish) and you NEVER want that. Did I mention that the weather conditions for the race were not ideal? It was about 50 degrees and had been raining hard for the past 22 hours. As of 2014, less than 200 individuals that had ever finished the Double Anvil, and I desperately wanted to be one of them. I had trained over two years for this day. I had planned, developed a strategy, executed the plan, and had thought about all the things that could go wrong and developed alternative plans. I had done everything that I thought I could to be successful and yet, there I was: I was not going to finish. I was going to fail; come up short. I had completed one of the twenty six two-mile loops when the “just take another lap” conversation happened. I needed to run 25 more laps (50 miles) after no sleep for the past 22 hours of racing through the night and in the rain. To beat the cutoff, I had to finish each lap in under 36 minutes. The problem was that my first lap was 39 minutes. I was losing three minutes a lap and there was NO WAY I was going to finish before the cutoff. I would finish 75 minutes too late. I was completely out of options. I had exhausted all my ideas and I had given everything I had and there were NO good solutions. That is when I asked Jenny to walk with me so I could complain to her that I was going to fail. She listened and then simply said, “Just take another lap.” After resisting, I simply took another lap, during which I changed everything. I prayed about finding a better way and I came up with the plan of just running 25 steps and then walking until I could run another 25 steps. So that’s what I did. At the end of lap two with this strategy, I was told that I ran that lap in 34 min. and 30 sec. That meant that if I did that for the next 48 miles without stopping for a bathroom break or food or anything, I could finish in 35 hours and 30 minutes. Thirty minutes before the cutoff. It was hard and painful and very challenging, but that is exactly what I did. I ended up a proud finisher in 35 hours and 20 minutes. That race and experience would also give me the confidence to return in 2016 and finish 3rd overall at the Triple Anvil (7.2 mile swim, 336 mile bike, and 78.6 mile run) in 57 hours and 21 minutes. So, why was “just taking another lap” so important? On that day, I gained great perspective of how God can work in our lives in challenging situations. I thought I was completely out of options, and I was wrong. However, God did not just provide an answer, He placed exactly the right person in my life, at exactly the right time, to say the exact (and only) thing that would allow me to find a solution to my problem. As a leader of any organization, there are times in our professional lives (and in our personal lives also) that seem like there are no good answers. No matter what decision we make, someone is going to get hurt or a relationship is going to be damaged. It seems like every option has significant negative consequences. No matter how much we pray to God to give us an answer or solution, it doesn’t seem to help. We are stuck. Even though we have put in the effort and explored different options and even consulted board members, mentors, or others that we trust, there are no good solutions. What I wanted to happen in my situation at the race was that I wanted God to validate that my training was enough, that my plan was right, that my effort would get me to the finish line. I was leaning on my own understanding. I was not trusting God with all my heart. When I realized that I could not do it alone or merely by my own will, I turned to God and hoped that He would provide a clear and simple answer. He did. What He gave me was the right person in my life at the right time with the right words. He gave me an opportunity to explore other options through Jenny simply telling me to take another lap. I was not going to figure it out and God was not going to give “me” a solution—rather God put the right person in my life at the exact moment to provide me with an option to TRUST. To trust Him and to trust the person that He put in my path. My wife Jenny could have told me many things that would NOT have worked: “You look strong!” (wrong), “You trained so hard!” (So what), “You can do it!” (in my mind I could not). Instead, she simply told me to “take another lap.” God used Jenny to make sure that I listened, trusted, and had an option to follow. God will place incredibly talented people in your life. It is your job to rely on them, trust them, and ultimately trust God with all your heart. Sometimes you won’t even realize that God placed these individuals in your life to provide you with the support you needed to help you avoid a difficult situation. One of the hardest things to understand as a leader is that you are placed in your position to assemble a team of great people, encourage them, serve them, and support them so that they can be their best to carry out the organization’s mission in service to the Lord. Most leaders feel that they need to make the majority of the decisions. However, sometimes you are often too close to the problem to see a good solution. It is at those times that I encourage you to look around and see who God has put in your life, specifically at that moment to simply tell you to “take another lap.” Be open to that someone who may be there with an alternative solution or an idea that you never thought of. God has you and God has your organization. My encouragement is for you to simply trust Him and lean not on your own understanding (Proverbs 3:5-6). Look around. Look for where God may have placed exactly the right person in your life, at the exact right time, to say the exact (and only) thing that will allow you to find a solution to your challenge. So when you’re not sure what to do: “Just take another lap.” From my experiences, that will work just fine. Cole Braun is the COW of the Lutheran High School Association of Greater Milwaukee. He can be reached at CBraun@lhsagm.org.